Sound Quest's Midi Quest multi-instrument editor/librarian gives you the tools to get the most from your Sequential Prophet VS Rack. Midi Quest includes all of the standard features you would expect to find in a Prophet VS Rack Editor and Librarian along with unique capabilities found nowhere else. MIDI Quest Pro, Midi Quest and Midi Quest Essentials allow you to manage the following SysEx from the Prophet VS Rack: Program Bank, Program and Wave Bank. Integrate the Prophet VS Rack with your DAW and use it the same way as a soft-synth or run the editor as a separate application connected to your Prophet VS Rack. You can display, edit, tweak, organize, audition, archive and manage your Prophet VS Rack from the focal point of your studio. Midi Quest Pro offers the widest selection of editor/librarian plug-in technologies: AU, VST3, VST2, AAX, MFX, and Studio Connections. Below is a small sampling of Midi Quest features. For more detail on Midi Quest and the differences between the three versions, please click here. Sound Quest has been creating SysEx editor/librarian software for over 30 years. It has also developed and/or licensed software to the top three synthesizer manufacturers as well major hardware manufacturers including: Korg, Yamaha, Roland, Alesis, Akai, Line 6, M-Audio, and TC-Electronic. 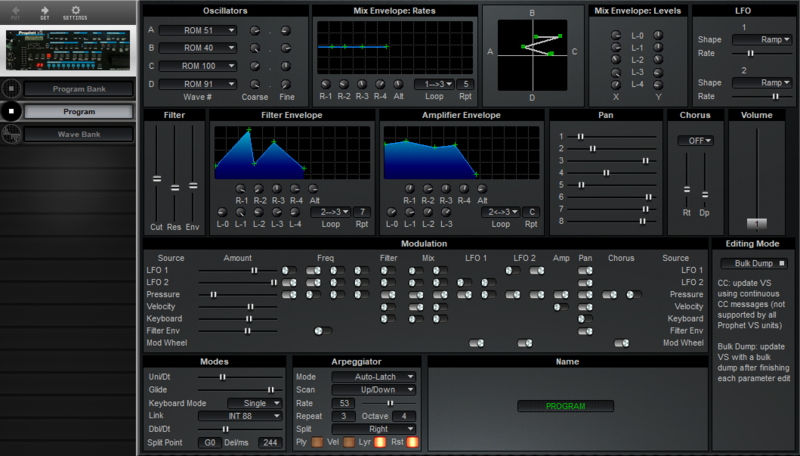 Midi Quest is the only professional multi-instrument editor/librarian that supports MIDI hardware from both a single instrument and an integrated studio perspective. Midi Quest is the only editor/librarian ever to receive a 10 out of 10 rating from Electronic Musician.